The need for a managed datacentre environment has grown within many organisations driven by the capital investments they now make in their IT systems and its importance to their operations. Servers were always ‘mission critical’ and remain so today but with a further level of complexity through virtualisation and shared services that has driven the need for both cooling and power protection to even higher levels. Several industry leading datacentre bodies and associations provide benchmark services designed to help organisations ensure the best possible power resilience, site security, energy efficiency and operational performance of their IT facilities. One such initiative is the Data Centre Alliance DCA Certification Scheme. 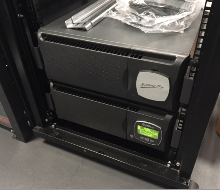 In most IT environments we now find servers housed in a rack cabinet. The servers themselves may be tower arrangements sat on a shelf or in a horizontal form fitted into the cabinet on sliding rails. Installation in a rack cabinet provides a central location for the all the related network infrastructure including hubs and routers which tend to be rack mounted. The use of a server cabinet reduces overall footprint and provides an easier to manage point for all power and IT network connectivity. The room itself may also be air conditioned with environment monitoring and a secure access system. In terms of power within the rack cabinet, the installation will include an uninterruptible power supply to provide power protection in the form of voltage stabilisation, spike, electrical noise, surge, sag and brownout protection and also emergency backup power – normally from a connected battery set. The protected output from the UPS system is typically delivered via power distribution units (PDUs) and these can be installed in either horizontal or vertical formats. The choice of UPS system is important and most UPS manufacturers provide both tower and rack mount formats up to around 10kVA. Limiting factors are the size and weight of the uninterruptible power supplies and their associated battery runtime packs. Most rack mount UPS will have an internal battery up to 3kVA and then use a matching battery tray. This means that a rack mount UPS system can take from 1-10U in terms of rack cabinet height. The alternative is to have a tower format UPS with battery cabinet installed outside the server rack and this a more popular arrangement for UPS installations from around 5kVA upwards. Another important aspect to consider is the supply ratings to and from the UPS which can also impact the type and size of UPS to be installed. Most small IT server applications require a single phase electrical supply. Where the power demands are higher than 6kVA within a server or comms room, the room itself may have a three phase distribution board. In this instance, the UPS installed must have a three phase input and either a single phase output or an output arrangement through a UPS-output-side sub-distribution board that balances the loads across three phases on the output of the UPS. For any server side UPS installation an external maintenance bypass switch is also recommended. A UPS bypass switch can allows the system to be powered down for maintenance or removed from the circuit without disruption to the IT loads. The UPS maintenance bypass switch itself may be rack mounted or wall mounted. An automatic static transfer switch (ATS / STS) can also provide a further level of resilience. An ATS or STS provides power to the loads and is supplied by one of two power sources; either two UPS or a UPS and separate mains power supply. If one fails or is accidentally disconnected the other supply automatically takes over. The difference between an ATS and STS is how the transfer is arranged. ATS tend to use relay connectors with a short millisecond break in supply and one that rarely (if ever) will disrupt power to a server power supply. STS transfer switches use static no-break transfer technology. For connectivity and remote management any installed uninterruptible power supply should also be connected to the IT installation via SNMP and may even be remotely monitored if the UPS supplier runs their own proprietary monitoring system. In terms of a managed environment the other aspect to consider is the overall efficiency of the UPS system(s) to be installed. Modern servers and IT equipment generate heat. The higher the operating efficiency the lower their impact on local air conditioning demands. UPS systems can also add to local air conditioning demands and the higher their efficiency, the lower this impact is. The benchmark UPS efficiency to aim for is around 95% or greater and over a wide operating loading range from as low as 25%. There are many considerations when it comes to choosing the right UPS system for a small datacentre, server and comms room environment. At EcoPowerSupplies we provide a complete installation and project management service and industry leading power protection systems. Two of our most popular uninterruptible power supplies for this type of application are the high efficiency Riello Dialog Dual (tower / rack mount) and the Riello Sentinel Power Green UPS with sizes from 6-10kVA. For more information please contact the Eco Power projects team on 0800 612 7388. Our team of experienced engineers can provide a free site survey, pricing and information on our comprehensive UPS ranges, installation and maintenance services.